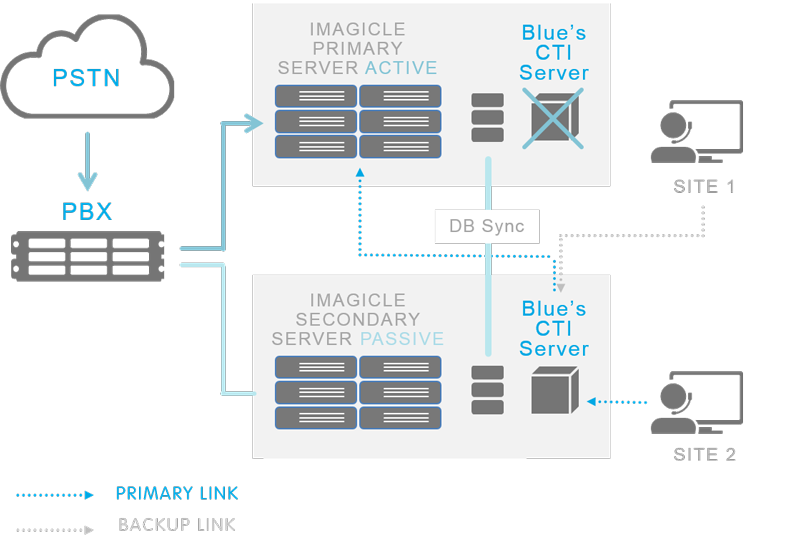 Blue's One CTI Enterprise is the client-server software by CTI (Computer Telephony Integration) that simplifies your work every day. It gives you complete control over your phone for all outgoing and incoming calls with notification pop-up messages that can be integrated with your CRM, lets you make calls from any application with a click, search all company and personal directories at once, and much, much more. Once you try it, you won't be able to work without it. On incoming and outgoing calls: all telephone operations directly from your computer. And much more: text messages, e-mail, etc. View the caller's name and information, and open the contacts CRM or management system card. Once you've logged on, you can access your profile and log on from any device. Manage all main operations with simple hot keys on your computer. Totally customizable. See whether your colleagues are present or on the phone, directly on your computer. Stay up to date, all the time. Search all personal and company directories at once. Integrated with Imagicle Speedy Enterprise. 500 clients per instance (physical or virtual). Multiple instances supported. Manual or automatic from CuCM via AXL or from Microsoft AD, LDAP/OpenLDAP systems and CSV files. Web API available to trigger users’ synch from 3rd party application. Can you be this fast on the phone? For people who spend a lot of time on the phone, like sales or support teams, speeding up and improving the efficiency of every operation means saving time and money. 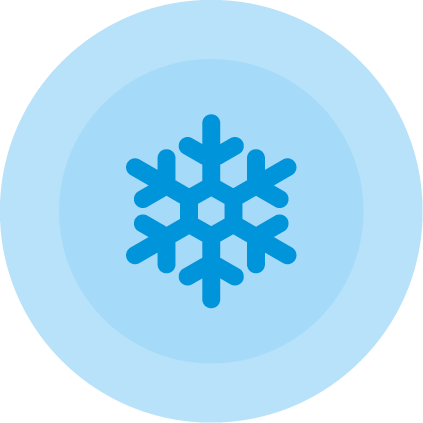 Blue's One CTI Enterprise helps you find a contact with a single search in all directories, see your colleagues' status, receive notification pop-ups with caller info, open a CRM contact card, and be notified of all missed calls. Once you try it, you won't be able to work without it. For people who spend a lot of time on the phone, like sales or support teams, speeding up and improving the efficiency of every operation means saving time and money. Blue's One CTI Enterprise helps you find a contact with a single search in all directories, see your colleagues' status, receive notification pop-ups with caller info, open a CRM contact card, and be notified of all missed calls.Once you try it, you won't be able to work without it. In a click you call, hang up and answer, put on hold, retrieve a call, transfer a call with or without consultation, and create a conference. Fast, easy and error free. 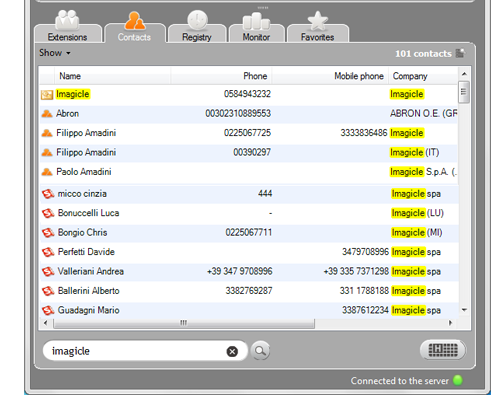 With a single search, you can find everything about a contact from all personal and company directories, including Imagicle Speedy Enterprise directories. With a click, you automatically open the contact's complete card in the integrated CRM-ERP, thanks to the free SDK development kit (SalesForce already included). With Blue's One CTI Enterprise's Hot Key, answering a call, searching for a contact or sending a text message becomes even faster. Simple key combinations are available for all functions and can be customized anyway you like. Select and call any number displayed on the screen wherever it may appear (document, website, e-mail, etc.) without having to write down, copy or enter the number. Quickly find a contact in all configured directories (personal, company or department, depending on your viewing rights) as well as extensions. Send a text message to a contact saved in a directory or any number able to receive one, through integration with Vola, TextMagic and Nexmo text message providers, or via the EasiSMS Enterprise Messaging Server. calling number and the contact in the integrated directories. If you miss a call, a handy alert provides the caller's information. Extension (Lamp Field - BLF) and presence status let you know immediately if a colleague is busy, to avoid wasting time calling and calling them. Presence module available for: Cisco Unified Presence Server, Microsoft Lync Server 2010 and 2013, Avaya Presence Services and Asterisk. Like many clients, GSK also needed to offer its employees a more advanced directory service than the one included in Cisco UC, adding info on internal contacts with external numbers, cell phone, department and site, profiling the directory per user-group and allowing access from IP telephones and from the web. Using the Imagicle ApplicationSuite, GSK's European employees now have a centralized company directory that's complete and synchronized, perfectly compatible with the global numbering plan and able to generate speed dial numbers for any contact. For some departments, the next step will be to centralize and synchronize the directories of external contacts, like partners, customers and suppliers, and to provide access to them from fixed phones, mobile devices and Cisco Jabber, using Imagicle gadgets. 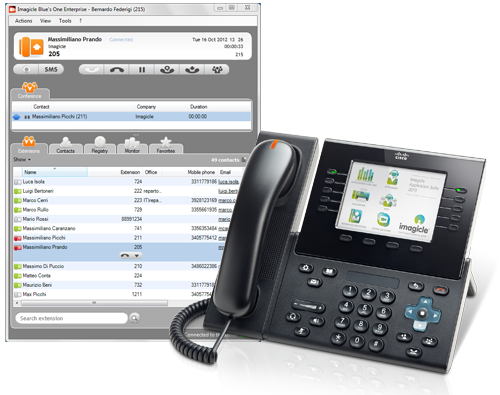 Ideal for Avaya, Aastra, Alcatel and Unify (Siemens) platforms and for other UC systems. 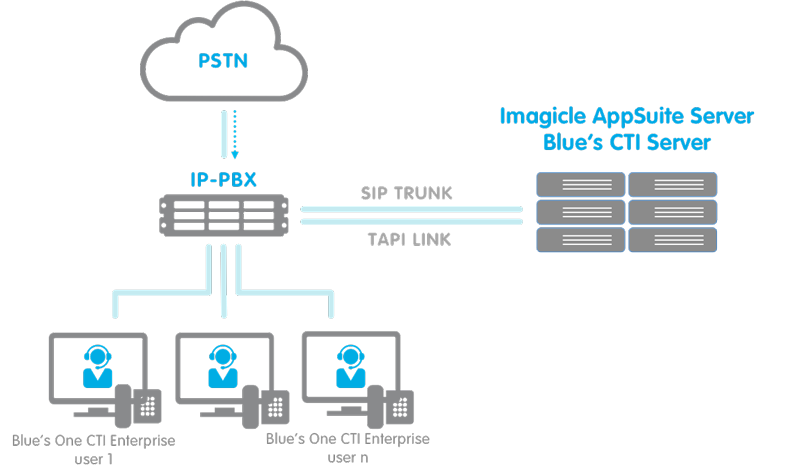 Blue's CTI Server, part of the the Imagicle Application Suite, takes care of the CTI dialog with the PBX and with other components (Directories, Presences). The client dialogs only with the server, thereby guaranteeing simplicity and maximum scalability. The client/server architecture can support up to 500 clients per server. The shared centralized CTI module can monitor up to 10,000 phones. Speedy Enterprise has to be installed on each computer and supports automatic provisioning of server configuration, user mobility through profile portability and automatic updates. The TAPI driver is installed on the server only. If the computer on which Speedy Enterprise is installed crashes for any reason, calls can be handled directly from the IP phone, without losing a single call, thereby guaranteeing a highly reliable architecture. A second server can also be used to guarantee continuous Speedy Enterprise operation in the event the main server is unavailable; the client automatically connects to the secondary server, continuing to use Speedy Enterprise, and avoiding annoying loss of service for clients. CISCO HCS 8.6, 9.x, 10.x, 11.x check telephony compatibilities in the dedicated section. CISCO Unified Communications Manager 8.6, 9.x, 10.x, 11.x, 12.x Cisco Compatible check telephony compatibilities in the dedicated section. CISCO Unified Communications Manager Business Edition 6000 8.6, 9.x, 10.x, 11.x,12.0 Cisco Compatible check telephony compatibilities in the dedicated section. CISCO Unified Communications Manager Business Edition 7000 8.6, 9.x, 10.x, 11.x,12.0 Cisco Compatible check telephony compatibilities in the dedicated section.